My friends and family know this, and now I’m going to share it with you too: Winter and I do not get on. I really struggle to find beauty in the dark and cold months. And with light as my photographic fuel and with so little of it in Winter, I definitely find it more of a challenge. We have just returned from a weekend in Aldeburgh, Suffolk. In my search for the light, I woke up early to catch a beach sunrise. I loved that our daughter and her best friend were awake before me, sitting on the beach complete with blanket and polaroid camera. Waiting. Together we watched the sun rise and the day break. This event that happens every day. And yet we are often so wrapped up in our daily rituals and chores, it is easy to miss. Yes, it was freezing cold. And I lost my lens cap on the beach because my fingers were so numb. But it was absolutely worth every second. It’s been wonderful to see some of you out there, enjoying the Winter light too; the light amidst the dark. Thank you for sharing your winter light with us! And those little twinkly lights that shine out of the dark too. I’d love to hear how you find the light in those winter months. I’m with you on hating the cold but your shots are absolutely beautiful! Love all those winter shots from the pool too. Yep, another winter hater over here. 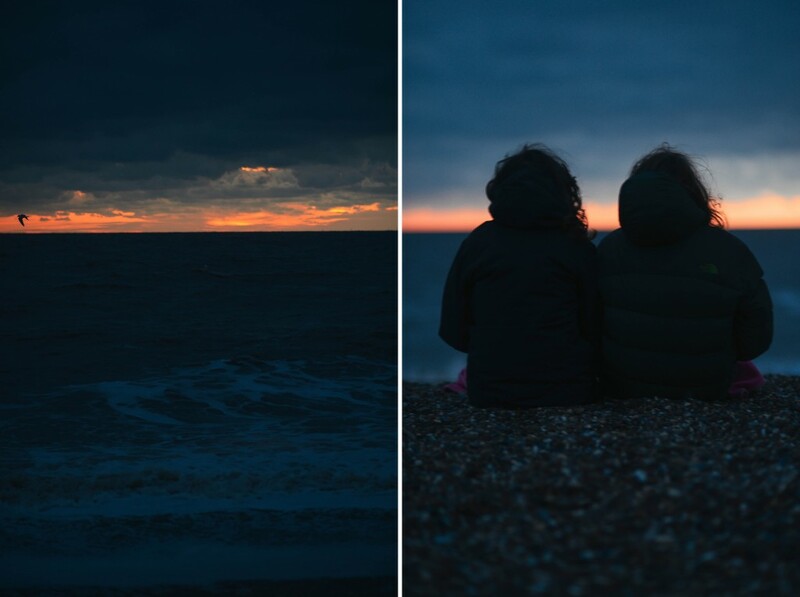 But I love your shots from Aldeburgh beach – the shot of your daughter and her friend is just beautiful. We are Suffolk lovers too – every year I tell myself I will get up early enough to catch the sunrise and so far I’ve failed – you’ve inspired me to make the most of it and just do it. Thank you for your kind words. 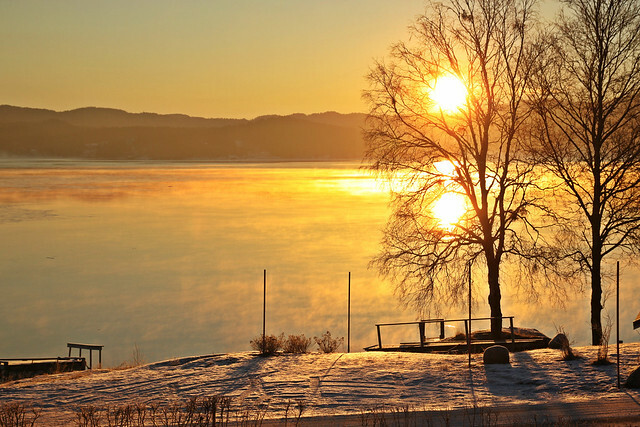 You won’t be disappointed by a winter sunrise! Enjoy! Thank you! Yes, I need to keep searching for what little light we have in the winter. 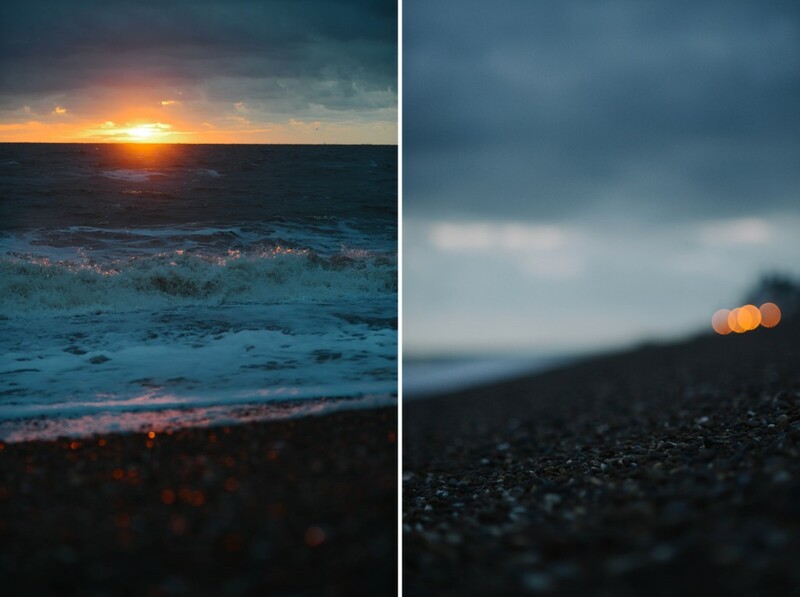 Your Aldeburgh sunrise photos are beautiful, Kirstin! That sounds like an amazing drop off spot, Valérie! You must enjoy the way the light on the lake changes throughout the year too. Absolutely stunning photographs Kirstin. You make me want to brave the cold Winter mornings. I feel I know this beach from your photos over the past few years, and I love that you had two light seekers with you for sunrise this time. Since I started regular picture-taking I have found winters to be much easier to handle. I bring color into the house, the springiest brightest cut flowers I can find mid-January through February (truly the cruelest month for me), and we usually force a few bulbs. When the winter light makes an appearance, I bundle up and shoot it with abandon. It has such a different quality, that is so lovely in pictures, that a day’s worth of images can sustain me through a week of gray. Or, as you noticed yesterday, I dig back into summer images. There’s always something warm and colorful that I cn play with for a while. i so love it when you visit that gorgeous seaside town and i am thrilled that you sat on the beach waiting for the sunrise–perfect!!! the winter is so long and can be very wearisome and i know i long for the sun too. 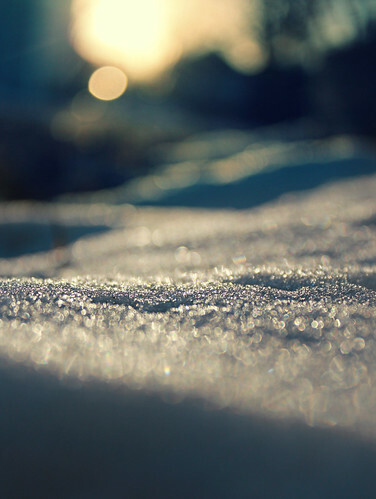 but there is a softness to the winter light that is lovely and i do really appreciate that more and more. thanks for sharing these gorgeous shots of yours and those of these other oh-so-talented shooters!!!! Such lovely blues in your beach shots. Winter can be tough. I look for signs of spring… even a small glimpse will do. Ugh, I have the winter blues so I am with you–waiting for the light to come back. I always love your images from Aldeburgh, you make me want to go there sometime. These are beautiful, and I love that your daughter and her friend were out there before you. The glint of sun on the rocks is perfect. I know there is less light in the winter, but the light that there is is more beautiful, I think, than the light any other other time of year. It’s always low in the sky, so even in midday it lights everything beautifully. In the summer, the sun goes over my house. In the winter, it pours into my windows. I love, too, when there is snow on the ground, and even if the sky is cloudy, what little light there is is reflected off the snow and into my home. For me, like Valerie, the timing of the light works. I often miss the evening golden hour in the summer, because it happens while I’m rushing around getting dinner and doing after-dinner chores, and my yard is not set up properly for summer light (we’re on a slope with lots of trees). We should probably change our eating schedule, but I haven’t managed that yet. In the winter, I can take a walk before making dinner or while it cooks and catch it all. Plus, like Valerie, if I manage to drive my girls to school in the winter (they usually take the bus), the reward is magnificent. Wow, beautiful captures. You are lucky to access to the water like that. Winter can be a challenge, but a sunny winter day is the best – the light pours into our front room. And I always buy tulips in January! I shall have to try and find some tulips tomorrow! They will surely put a smile on my face! Thank you. oh my this is the most beautiful set of photos, the sunrise! it’s so obvious, what stunning light and reflections on the water! I am just back from a trip to Amsterdam and oh boy my photos are such a disappointment with all those horrid white skies and washed out colour, plus there wasn’t a damn tulip to be found this early!! “…the light amidst the dark.” Love those words! Thanks for sharing the beautiful images. Ah yes, winter, not my fave season. In fact, my least favourite! I have to force myself to get out in the bitter cold at times, but so far this winter has been very rewarding in terms of finding some gorgeous light. I’ve been enjoying the setting sun against barren trees, and how everything just looks sparkling against the white snow. If anything, winter pushes me more to seek out those photo ops, as they are not always obvious! Now you’ve inspired me to take advantage of the late sunrise( I’m not an early riser, esp. at -15C) and get myself out there to capture it. LOVE your post & the beautiful images that accompany it, Kirstin! Gorgeous, gorgeous light in these photos!